FRONTLINE Plus Flea & Tick Spot On Treatment for Dogs kills fleas, ticks and lice and stops flea eggs hatching in your home. 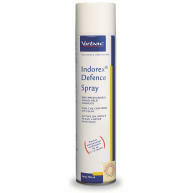 It is fast acting and kills fleas within 24 hours and ticks within 48 hours. 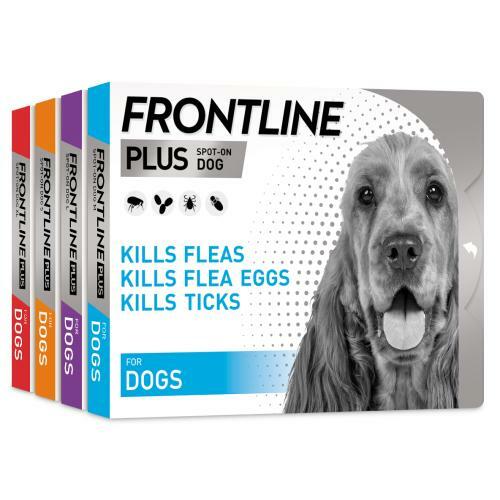 Frontline Plus also attacks eggs and larvae to keep your pet parasite free for longer. Frontline Plus Flea & Tick Spot On for Dogs is the most advanced formula within the Frontline range of flea and tick treatments. It not only kills fleas, but also stops their eggs from hatching and infesting your home. Unlike other flea treatments, Frontline Plus kills ticks too, helping to reduce the risk of tick-borne disease transmission. 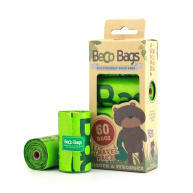 Use every 4 weeks all year round for optimum flea and tick protection. Please note: - These are medication products. To comply with VMD regulations and to ensure you receive the correct product for your animal, we will need to collect some basic information about your pet. Thank you! 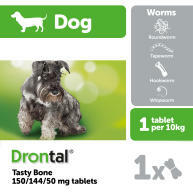 1 pipette of 0.67ml per dog weighing over 2kg and up to 10kg (approximately 7.5-15mg/kg). 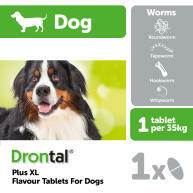 1 pipette of 1.34ml per dog weighing over 10kg and up to 20kg (7.5-15mg/kg). 1 pipette of 2.68ml per dog weighing over 20kg and up to 40kg (7.5-15mg/kg). 1 pipette of 4.02ml per dog weighing over 40kg (7.5-15 mg/kg).